THIS year is a big one for The Beatles in many respects. today marks fifty years since they climbed onto the roof at Savile Row to perform their famous gig – the last time the band performed live together. That concert was a revelation and unique thing in 1969. No band, to the best of my knowledge, had taken such a step and it brought the surrounding areas to a standstill. The most famous band taking to the roof to jam together a final time must have been an emotional experience for the lads. The fact they were all smiles and thrilled unsuspecting people to this great outdoor gig ranks alongside the most iconic moments in musical history. It has been announced that Sir Peter Jackson will direct a film that edits footage of The Beatles recording their final album, Let It Be. Of course, the final album to be recorded was Abbey Road – Let It Be was released in 1970 but recorded the year before. Later in the year, we will mark fifty years of Abbey Road and it will be a big occasion. The band knew this was their last fling and, because of that, they were more united and relaxed than they had been in a while. Let It Be followed the success and popularity of The Beatles and, whilst a packed and eclectic album, one could feel some cracks. I wonder whether there was a feeling in 1968 that, soon enough, the band would start to fall apart and there would be tension. It is remarkable to listen to this ambitious and daring album, The Beatles, and then compare it with Let It Be. Although Let It Be has some wonderful moments – the title offering and The Long and Winding Road – there is less of the fun and upbeat songs that were present in previous albums. Maybe it was clear there was strain and the group were not completely harmonious. The new project has been announced and it provides this rare and comprehensive look at a band going through a very changing and important time. By 1969, they had stopped touring and sounded very different to the band that thrilled back in the early-1960s. “Jackson is collaborating with the Beatles’ record company Apple, with the approval of McCartney and Ringo Starr, as well as Yoko Ono Lennon and Olivia Harrison. Lindsay-Hogg’s Let It Be – compiled from footage shot in January 1969 as the Beatles worked on what was to become their final released studio album – has long been out of official circulation since it was last available on home entertainment formats in the early 1980s. Attempts to reissue it since have never come to fruition; however, Apple say that a restored version will be released after Jackson’s edit. The film has always held interest to Beatles fans as it documents the group at a time when tensions within the band were beginning to become obvious – including George Harrison’s decision to walk out after a few days of filming”. It will be remarkable to see this film for a number of reasons. For a start, any new Beatles-related material is great and not many have seen the band in the studio creating. It is remarkable to compare The Beatles in 1969 with the bright-faced and cheeky boys that broke through only a few years earlier. They had toured extensively and gone through a lot but it was clear that Let It Be was the beginning of the end. It may sound completely bleak and exploitative but seeing the band working on their last (released) album is a treasure trove for fans. There is very little footage of the band compiling songs and recording but, as it is fairly intrusive, they had been reluctant until that point. Whilst the cameras did add an element of tension and pressure, it captures the complexities and chemistry that defined The Beatles. It is sad to think an album like Abbey Road is fifty very soon and, this time next year, we will be preparing to mark fifty years of Let It Be. The Peter Jackson film will culminate with the roof performance atop the Apple offices on Savile Road and the finished project will hone fifty-five hours of never-seen-before footage. I think a film that portrays that recording as angry and unhappy will drive people away but, as has been announced, there will be plenty of fun, humour and interesting moments – balanced with the more tense and fractious times. There is a new generation growing up who are discovering The Beatles now and might only be listening to their albums on Spotify. Maybe they check out a few videos but they might not be aware of the history and why Let It Be, despite the material not being the strongest of their career, is a vital addition to their cannon. The album sounds very different to anything they created and, in fact, a sense of disconnection actually creates this very striking recording. I think there are some really underrated tracks on Let It Be – including Two of Us and One After 909 – and I am interested to see how they came together. This was a period when Paul McCartney was exerting more influence – it was his idea to let cameras into the recording studio – and he would be the one to get producer George Martin back for Abbey Road after Phil Spector took control for Let it Be. I love a lot of the tracks on Let It Be and it is interesting to see this leadership from McCartney; John Lennon and Yoko Ono in their camp and George Harrison and Ringo Starr in their corners. The band still wanted to record and be together but it is clear they had reached a point where true agreement and the flair they had years before had gone. I am interested to see what direction the film takes and whether we get to see some of the more heated moments. The reason I am particularly interested in seeing the Let It Be film is because of the fact it is the band crafting these songs and going through the process. It is fascinating seeing the biggest group in the world discuss the music and shoot the breeze. Maybe having people film was a bit pressurising but I know there is footage of the band relaxed and joking with one another. I am interested to see how songs like Let It Be and I Me Mine started life and matured through the recording process. There will be some awkward moments and some great jokes; songs being compiled and the band jamming. There is so much footage to scale into a single film and I wonder whether a Netflix series would have been an idea – surely a longer investigation is needed? 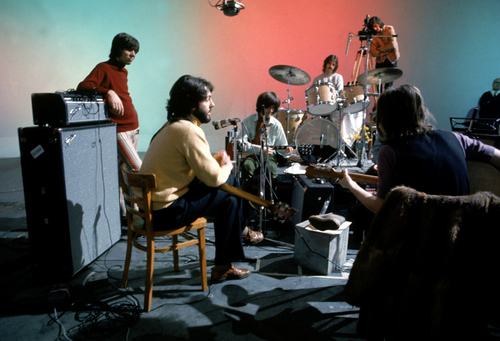 In any case, Let It Be was a big time for the band and one where they were sort of just hanging on. They would split soon after Abbey Road was completed but, The Beatles being The Beatles, there were amazing tunes coming from all corners. Harrison would create his best material for Abbey Road (Something and Here Comes the Sun) but he contributed I Me Mine and For You Blue for Let It Be. Lennon would write finer cuts for Abbey Road but Across the Universe is a treat that stands up after nearly fifty years – Dig It is a rare occasion of all four band members contributing. Although Let It Be is Macca-heavy – even though he and Lennon probably contributed the same to the album one feels McCartney’s influence more – I love the fact we get such a deep and long-lasting look into that recording. It is not the case of a few minutes being scraped together: fifty-five hours is almost unheard of in this age! How often do we get to see The Beatles putting an album together and get this very natural – as much as they could be – representation of them near the end of their career. After Let It Be and its rather tumultuous experience, they decided to go back to basics a lot for Abbey Road. George Martin came back and, knowing this was the last album they’d record together, the music sounds more free, exciting and cohesive. That rooftop gig – fifty today, let’s not forget! – could not have happened were they balkanised and separated. The Beatles were very much the brothers they had always been but maybe the creative pressures and lack of inspiration meant the most compressive in-studio look at the band was a little misjudged – recording Sgt. Pepper’s Lonely Hearts Club Band in such detail would have been epic! That rooftop gig was them, in a way, free of the confines of the studio and able to achieve what they really wanted – playing a gig and being able to hear themselves play; not drowned out by fans and able to let the music be heard! THE same boys we’d always known.